As a reporter approaches Dreamland, the forest thickens. The boughs of tall softwoods are heavy with snow and ice from the week's winter storms; the trees seem to lean in as the road narrows. After about a mile on a dirt road some seven miles north of Montpelier, tracks indicate a plow truck has stopped, turned around and retreated, after clearing a small pull-off cut into the hillside. From this point on, the journey continues on foot, but it's not far. The home base of the Green Mountain Druid Order, known as Dreamland, is also home to Order founders Ivan McBeth and Fearn Lickfield. From the pull-off, it's a five-minute walk, even when the path is covered in a foot of snow. The woods are silent but for the sound of ice cracking and falling off the branches; the quiet is a welcome respite from the holiday bustle in Montpelier and the chaos of the ongoing winter storm. The Druids, I'll soon learn, embrace this insular calm at midwinter. Still, they find plenty to celebrate during the season of short days. The celebrations inevitably involve feasting — and drinking. But unlike many revelers this time of year, Druids tend to take the festivities outside. Sometimes they even toast the trees, as an honor to the harvest. McBeth and Lickfield founded the Green Mountain order in 2006; it's now about 60 Druids strong. The 70 mostly wooded acres that the couple shares serve as a spiritual and educational center that offers classes, workshops and ceremonies for Druid study. The Order's website describes Druidry as an "ancient and evolving path." Lickfield and McBeth maintain that the tradition is nondogmatic and highly individual, essentially a process of integration with the natural world and the beings who populate it. Though the original Druids and their traditions disappeared from England back in the Iron Age, today's Druid communities — or "groves," as they call themselves — are not only interested in forging connections among humans and between humans and nature. They're also hoping to engender peace, both within and without. McBeth, 62, who hails from the UK, is an imposing figure, broad shouldered and standing well over six feet. For all his brawn, he's lighthearted and laughs easily. Today he's wearing leopard-print fleece pajamas and slippers, and his white hair falls in curls around his face. McBeth says he was always drawn to nature. When a previous love introduced him to the local Order of Bards, Ovates and Druids, he was impressed. Wow, what an amazing bunch of people, he recalls thinking. Over the decades since, he has helped build dozens of megalithic-style stone circles around the world, including one at Dreamland and another, which functions as an "Earth clock," in Burlington's Oakledge Park. Those circles are considered sacred spaces and can be used for ceremonies, but McBeth is quick to note that Druidic practice means different things to different people. "There's no dogma in Druidry," he says, "so you can believe what you like, as long as you don't hurt anyone. Some people believe in gods, some goddesses, some gods and goddesses, some nothing. Whatever it is, it doesn't matter. [Druidry] has everything to do with behavior and how you connect: how you connect with nature and your fellow human beings." Lickfield, 44, says agriculture led her to Druidry. "I was an organic farmer, and I was very tuned into the seasons and the cycles of the year," she says. "I wanted to celebrate that: the planting season, the harvest season. Also, tuning into the spirit of the land and the plants." She was practicing Wicca when she met McBeth, but says the Wiccan traditions didn't feel quite right for her. As she learned more about Druidry, it did. Though the Druid tradition isn't overtly food oriented, the connection between the land and the food we eat is undeniable. Lickfield and McBeth keep gardens, forage edible and medicinal plants and mushrooms, and brew their own alcoholic beverages. On this day, we sit in their round, off-the-grid house, gazing out windows south and east, over the stone circle and a tall evergreen forest that gives way to a rolling ridgeline. Just outside the circle stands an apple tree — the largest fruit tree on the property. Later this season, Lickfield says, she'll offer the tree a ritual blessing. In ancient English tradition, "wassailing" described a ceremony performed in apple-growing regions such as Herefordshire and Devonshire — where cider was a staple beverage — to ensure a healthy fruit harvest the following fall. Lickfield says that several Druids in her grove practice the wassail annually, and she plans to invoke the tradition at Dreamland this winter. She and McBeth will mull a beverage with warming spices, apples and sugar; gather a group together; and surround the sacred tree. They'll pass the warm drink, sip it, splash some on the tree's roots, soak a bit of toast in the liquid and place it on the tree, and end the ritual with a gleeful "Huzzah!" "The whole idea is that you are basically feeding the spirits," Lickfield says. "It's also protecting the tree from evil spirits that might cause disease or infection or parasites. It's honoring that from which we get our food." Lickfield says the apple tree, as a provider of nourishment, is sacred in the Druid tradition. 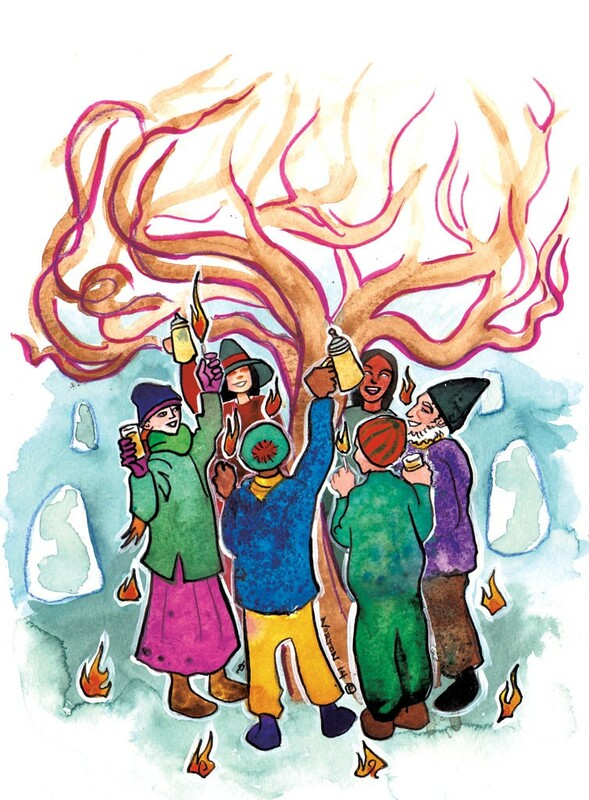 "So 'wassail' means good health," she says, pouring three glasses of homemade elderberry mead from a recycled Jack Daniel's bottle. "Actually, the word 'toasting' comes from the wassail tradition," Lickfield continues. "You have your warm, alcoholic, spicy beverage, and you float toast — actual toast — on top." McBeth leans forward as she hands him the drink and smiles. "There's another story as well," he says. "That 'Wassail!' is what Druids shriek just before they fall down in inebriation, when they're in the frenzy of celebrating. They go 'Wassail!' And they collapse." He falls back in his chair with a laugh. "That's the Ivan version," Lickfield says. With that, we raise our glasses for a cheer. The drink is spicy, lightly bitter and sweet, with notes of cherry — in a word, merry. The elderberries impart a fruity overtone, and it drinks like a glass of warming, sweet wine infused with spices. "This would be good warm," Lickfield says, clasping the glass in her hands. The honey for the mead comes from Druid neighbors at nearby Bee Haven Honey Farm. The elderberries also grow locally; McBeth says they have a friend with a beautiful grove of elder. "When it's ready, he phones us up, and we go in with buckets and pull loads out," he says. "It's just full of berries hanging and waiting to be picked." Folklore surrounds the elder, Lickfield notes. "It's considered a plant of the faeries. There are stories about how if you fall asleep under an elder bush you'll get transported to another world. And this strong female spirit called Eldemore," she adds. "She is the spirit of that tree. If you cut down that tree without asking her permission, you get in trouble. There are some pretty interesting stories there." The elder harbors potent medicinal qualities: It's been known for centuries to help with cold and flu symptoms. Its flowers are as medicinal as the fruit. "It's an extraordinary healing plant, elder," McBeth says. The drink warms belly and spirit on a cold, dark day. Outside, the sky is a rippled gray expanse leaking frozen drizzle over everything. It's early afternoon, but the sun, lost behind a nimbus veil, has already crested the horizon; dusk will soon fall. Such are the days leading into the winter solstice. "It's the longest night [of the year], the pivotal point of darkness," Lickfield says. "Our society is very scared of the dark, but we [Druids] really celebrate it. "Solstice actually means pausing of the sun," she continues. "If you look at the horizon and how, over the course of the year, the sun moves along the horizon — where it sets and rises — for about three days at solstice, it looks like it's just hanging out. It's not moving in one direction or the other." For Druids, Lickfield says, it's a time for turning inward and pausing — "going into our own darkness to find out what's there," she says. If that means facing one's inner demons, it's also about discovering a glimmer of light. 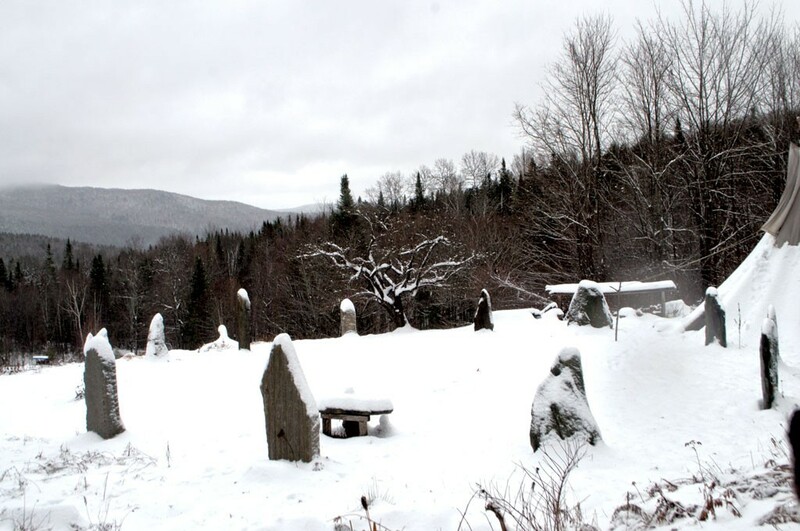 "The winter solstice is a real time of hope and optimism," McBeth says. "Even though things look a bit gloomy, there's that spark that's only going to grow from now on." McBeth and Lickfield see winter as a time to slow down, take stock of the year that was, and integrate those insights with hopes and visions for the year that will be. Before he married, McBeth says, he would retreat to a cave for weeks at midwinter. "There's something special about being in a place that is surrounded by earth or rock," he says. "It's very peaceful and cleansing. I really had a problem with the franticness and the manicness during a time that I believe should be silent and peaceful." 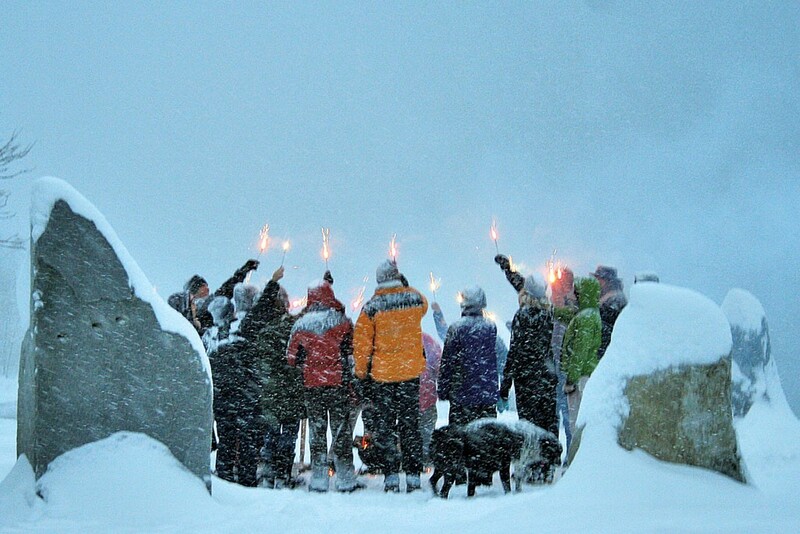 On Sunday, December 21, McBeth and Lickfield will host their annual winter solstice ceremony at the circle in Oakledge Park. Each year, dozens of people take part, and not just Druids. "Our ceremonies are very participatory," McBeth says. "We get people joining in, dancing and taking part. Helping light the fire, singing together, whatever it is." Afterward, the Druids will retire to a potluck feast at one of their Burlington members' houses. "We eat very well, actually," McBeth says. Lickfield says the modern Druid food tradition aligns well with locavorism: "It's about working with what's fresh, what's available, what's local and seasonal." "There's a definite richness about it," McBeth says, "and loads of desserts." After the feast, the Druids will take their leave, going their ways in the cold, quiet darkness of winter's longest night. The original print version of this article was headlined "Druidic Dream"
Moving megaliths in West Chazy, N.Y.
Give a Twig and Send Us Your Tree Photos!